This week I have been mostly eating… less. And doing more. I am keen to get stronger and increase my stamina in time for Angelus Peak at the end of October, since every time I go out in snow I can’t believe how exhausting I find it. And so it was time to stop moaning about this and start doing something about it. Aided by the Fifth Great Annual Sober September I have been ramping up the jogging & climbing and eating only two puddings instead of the usual five. So what better way to get fit than a couple of horrendously tiring walks in the Tararuas? Last weekend I redid the Kapakapanui Circuit. The good thing about the Kapakapanui Circuit is that it just goes straight up and straight down. No fussing around with all these mini peaks and ridges. The bad thing about the Kapakapanui Circuit is that it just goes straight up and straight down. Going anticlockwise, It’s about a 950m climb, followed by about half a kilometer of exposed ridge, then a gradual descent. The other bad thing about the Kapakapanui Circuit is that it starts and ends with six river crossings. Nothing like beginning a six hour tramp with soaking feet. This time the first two were knee height and quite fast flowing. However the good things about six river crossings is that the discomfort of a river crossing almost entirely drops off after the first one. Until, of course, your feet are warm and you have acclimatised to the saturated socks, and then you have to cross the river again right at the end of the day. However this time round, I found the track really pleasant – well graded with generally decent footings. (I suppose I must really be learning to love these hills if I now describe this sort of walk as really pleasant.) And, unlike the first time I did this walk, I managed to get rewarding views from the ridge. But that was just in training for the main event: Renata Ridge. There’s nothing like gale forecasts of 100km/hr to lend the run-up to the weekend a slight nervous edge. But spirits were high in the minibus so I could only assume either the others hadn’t seen the forecast or that I was the mad one: that heading up to a ridge with that forecast was a completely straightforward and sensible thing to do. Presumably there’s a word for that self-centred anxiety we all get about hoping there’ll be room for us in the hut, cursing the other folk who deigned to have the same plan for the weekend, but had the audacity to get there slightly earlier. It pains me to admit that I carry this selfish malaise. We should certainly invent a word for the specific variant of this ailment when it concerns Field Hut, which is a starting point for many-a-Tararua adventure, from overnight family trips to epic multi-day ridge adventures. But I didn’t need to worry, for after our brisk head-torched enabled walk up – an easy track, though I certainly don’t consider this 750m ascent insubstantial after a full day at work – we neatly slotted in to the remaining beds and no doubt made it a bit warmer for the other groups too. In the morning the wind began to rise, and as we ascended from Field to Kime Hut it became increasingly ‘breezy’, one might say. * At Kime Hut I nearly lost my hand in the toilet door, so viscously did the wind slam it shut as I exited. So we decided to take our time at the hut with a cuppa, warm up (the wind chill having been well below zero) and see if the winds would die down. The weather gods were on our side, for sure enough the winds died down within 30 minutes (the pause as the Southeasterlies and Northwesterlies changed shifts, we hypothesised). When we set off up to Hector it was manageable, slowly becoming pleasant, and then positively lovely. At Hector we spied the other group coming our way and enjoyed tracking their progress as they crossed towards us from Field peak. From Hector we travelled gently down and up the various bumps on Dress Circle track, enjoying the glorious visibility. We were loathe to leave the tops so stayed for a second lunch, but the wind was returning so it felt like a good time to start our descent. 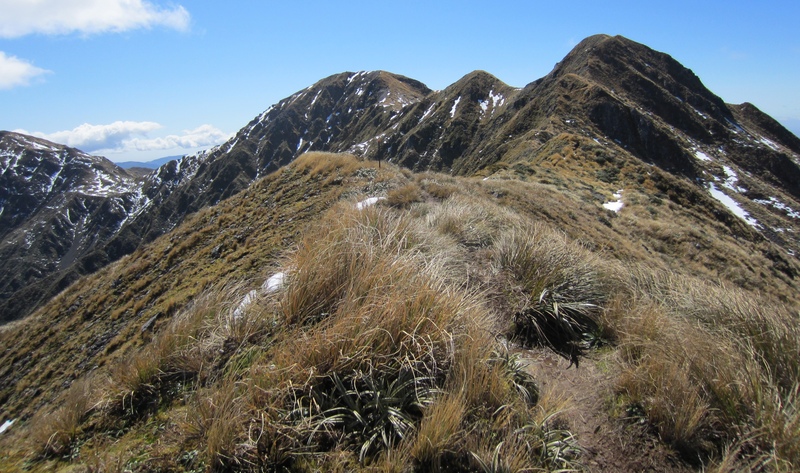 The descent to Elder Hut was a typical steep Tararua treachery – I was glad we were descending rather than ascending this one. Elder Hut isn’t that often frequented due to its moderately inconvenient location but it is a real treat – small, warm, and marvellous westerly views. We sat drinking tea watching the sun set and predicting the weather, using our new skills following Tony’s wonderful talk at the club last week. I spotted a line of clouds above a far away range and casually predicted doom. Meanwhile, our trip leader pulled out a ‘come dine with me’ surprise when he revealed he had brought ginger cake and custard for putting. I probably shouldn’t have celebrated when the clouds I had been suspicious of turned into a brutally windy night and then a constantly damp and rainy Sunday. But I was pretty proud of myself. We left the hut wrapped up to the nines, but we only had a few exposed sections before we were back in the trees and soon warmed up. We intended to navigate down the ridges via points 925, 708 and 687, as many trampers have done in the past, judging by the hut book. We reached our junction after an hour and got compasses and GPS at the ready. Alternately led by my tramping buddies, we worked our way along the ridges, following foot pad where we could find it or picking our way over, under and through the trees when we couldn’t see tracks. It was slower going than we had expected but we got into a steady rhythm. For want of some kind of notable point amongst the unchanging forest, I celebrated our arrival at point 687 (what a memorable place! I will definitely never forget that time we were at 687!). It was tiring on the concentration though so I was relieved when we made it back to the four wheel drive track that led us to Waiotauru track. The rest of the track was easy, though long, and we were treated to a final rain shower once we got out the bush to make absolutely certain we and our packs were thoroughly wet-through. *I only just found about the extra season that Wellington and surrounding areas enjoy during this part of the year. Probably better not to be warned about these things. Long shadows! Longer days! Hurrah for the clocks changing.